“What is it exactly, how can I describe, all that I discovered by that fireside”. There is something unique and heartwarming about the sound of a group of such incredible people singing their hearts out while sitting around a campfire. The fire gives off not only a sense of physical warmth, beauty and visible light, but it has a way of connecting those sitting around it. The flames dance and move in a way that is hypnotising and remembered by everyone who sees it. The smoky musk that fills the air is a smell that is sentimental to camp. Those moments singing around a campfire with the people I have grown up with at camp, and love more than anything in the world, is one that is taken for granted but will never be forgotten. Camp is a place of community, faith, growth and friendships, all sparked by summer nights around the campfire. There is a sense of community at camp that is overwhelming and unlike anything I have ever experienced. Each individual that comes through camp has the blessing to experience a place rich with love, support and faith. Camp is a place that I come into each summer with high expectations, and they always seem to be exceeded, I walk out of camp a different person inside and out. It has helped me build relationships with some of my best friends, and I know that these are the people I will be close with for the rest of my life. 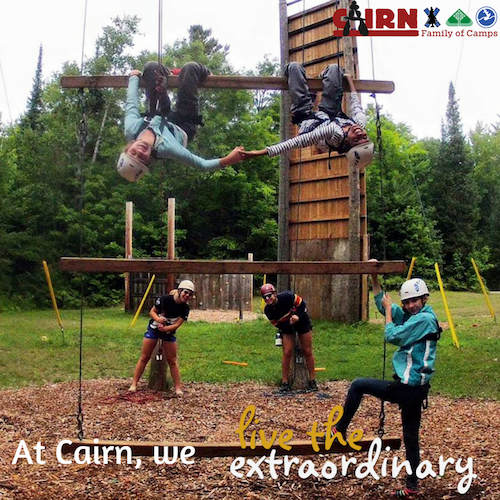 There are specific moments at camp that makes Cairn so different from any other camp, the passion and enthusiasm felt every second of every day is electrifying. A moment that speaks to me the most about the sense of community at camp is those first steps back, after a long year away. The drive from the highway, down the driveway, into centre camp always feels as though it takes an eternity, mostly due to the excitement of finally getting back. At camp we have a tradition that every camper, staff, volunteer, and visitor, is greeted with a simple, yet very enthusiastic “Welcome Home”, most often followed by a group of people swallowing you up in a group hug. It doesn’t matter whether you are a long time camper like me, or it’s your first year at camp, when the first thing you hear as you get out of the car is “Welcome Home” there is a sense of safety and ‘hominess’ that fills every cell in your body and it is impossible not to smile. I find it remarkable that two simple words, “Welcome Home”, can create such a strong connection and feeling of community between the first time campers, and those returning to camp year after year. Personally I will never get sick of hearing those words, even after 11 years at camp it is still one of the things I look forward to most about going back. Another tradition that we have at camp is every night we gather in the lodge or around an open fire on the beach and have a campfire. This is a time for the whole camp to come together to sing, worship, and be together before heading off to bed. Not only is this my favourite part of the day because we get to sing songs and talk about our day with friends, but it is the only time of the day that everyone on site is in one spot. This creates a bond between everyone that is indescribable, and it is a really incredible way to end our day together. The fire acts as a magnet by connecting everyone sitting around it, and creating a pull that feels as though it can not be weakened. Personally, sitting around the open fire is where I have connected with some of my best friends and we always make a point of getting together for a campfire even outside of camp. This shows that the fire truly is where relationships are built and re connected year after year. Camp is a place of games, fun, laughter, new experiences, and silliness, but it has also been a place where I have grown into the person that I am today. I would not have grown to be a leader or devoted to my faith, and I definitely would not feel as confident being myself as I am. When I first started going to camp I was a very shy six year old who didn’t really know what to expect. I don’t remember a lot of the small details from that first week, but I do remember the amount of love and safety I felt throughout the entire time I was there. For my first few years at camp I was young and I never truly realized the impact that it was having on me until about my third, and I started to see that it is truly changing me. Fire is the symbol of life and growth, and I believe that as I sit around an open campfire staring into the orange and blue flames, I see the potential that I have to be anyone that I want to be. Each week I am at camp I grow as a person and I walk away from camp with a different perspective on faith, relationships, and life. Camp has shaped me into the person that I am by helping me see the potential I have to be anyone I want to be, and giving me a space where I can truly feel safe to be who I am. In the last two summers at camp I have felt myself grow the most, I have had the opportunity to participate in programs called Pre-LIT and LIT. Both of these programs start to focus less on being a camper while taking more of a leadership position around camp. These programs helped to develop my personality and started preparing me to be on staff. This past summer especially, during the LIT program, I found myself using my time at the end of the night around the fire to reflect on myself and see the self growth that had taken place throughout that day. I find myself getting lost in the flames of the fire and seeing myself as a hard working, independent, mature girl who has the ability to conquer anything. I have also grown in my faith a lot over the past couple of years through camp. When I was younger I didn’t really understand the idea of God or my faith, I went to church every week but it never really meant anything to me. Camp was really the first place that I truly felt connected to to God and felt confident in expressing my faith. Sitting around the fire at camp, singing worship songs and talking about my faith was where I first started to feel a connection to God. I believe that because sitting around the fire is where I feel close to God*, *fire is my guiding light and it is a common image that I will always relate to my faith and Christ. Camp has helped me to see God in the fire and helped me to start seeing Christ as my guiding light. I find myself looking to him in times of need as well as in times of happiness. At camp I know that at the end of the day I can always rely on singing around an open fire and talking with my best friends. I know that this is God’s way of reaching out to me in order for me to build a strong connection with him. Camp has also really solidified my faith and helped me to realize that going to church every week is not all that is involved in being a follower of Christ. Camp has taught me that my faith is my own and that my morals and values have a huge impact on what my faith will be. The idea of seeing Christ as my guiding light has really proved to be true for me throughout my years at camp. There is something beautiful about the community, as well as self and spiritual growth that can immerse from a night around the camp fire with people you have grown up with. Camp is so much more than a beach, a rock wall, and a zip line. Like a fire, camp is not only a place of beauty and fun memories, but it is a place of community, warmth, family, and never ending light. It has been a huge part of my journey so far, and forever will be a significant part of my life. It is a piece of me and has helped me become who I want to be, meet my best friends, and has showed me what a community truly is. I am forever thankful for the place I call home and the blessings it has given me. “Cause it’s more than the green of trees, it’s more than the summer breeze, the smell of rocks and water washing over me, it’s more than the orange fire, it’s more than the fishing wire it’s more than the cabin walls, or that morning bugle call”.